Investment banker turned restaurateur David Kostman, founder of Nanoosh Mediterranean Hummus Bars & Counters, shares his passion for healthy organic meals and a few back to school “fast foods” that parents can quickly make for their kids. Coming to a fast food eatery near you: Hummus. At least that is the rumor in the quick service restaurant industry. Though big name fast food restaurants may bring in hummus as a healthy menu choice, it won’t detract from the fat selection of the sodium-laden, high-calorie items. As it turns out, the popularity of hummus not only inspired Kostman to change his career, it put his healthy eatery Nanoosh well ahead of the quick food service game. Unlike big name fast food chains, the menu at Nanoosh provides hungry patrons with organic, natural ingredients. Dishes feature grilled chicken, tomato, cucumber, lemon, quinoa, cilantro, garlic, red pepper, cranberries, onions, and lentils. “Quality of the ingredients (a vast majority of our ingredients are organically grown), freshness, and tasty nutritionally-balanced recipes drive our ingredients and menu selections,” Kostman explains. 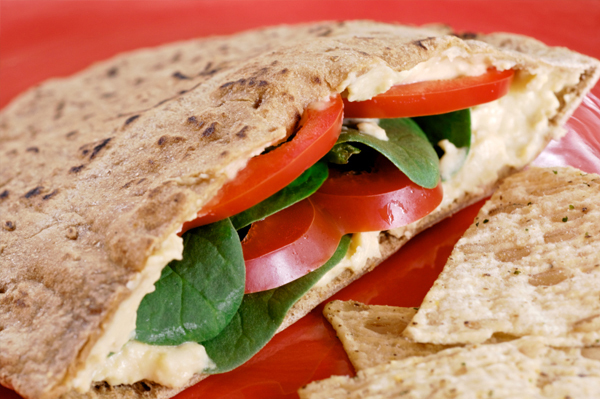 You’ll always find a variety of salads, hummus-based dishes, soups, and whole wheat wraps. In addition to making healthier choices when opting for fast food, Nanoosh’s nutrition specialist Hadas Smirnoff encourages families to stock their kitchens with healthy ingredients for fast homemade meals. Chickpeas – The base for hummus, chickpeas are an excellent source of detoxifying minerals as well as fiber, which digests slowly and keeps blood sugar levels from rising too rapidly. Lentils – Another source of protein and fiber, lentils are a low calorie, low fat, and cholesterol free food that can balance glucose levels and decrease insulin requirements for people with diabetes. Extra-virgin olive oil – A key ingredient for hummus, rich in monounsaturated fat. Fresh vegetables and herbs – Chockfull of vitamins, minerals, and other phytonutrients, vegetables and herbs are low in calories and high in flavor. Quinoa – A complete easy-to-digest protein-rich grain containing all nine essential amino acids, which are required as building blocks for muscles. Whole grains – Compared to refined flour products, such as white rice and white bread, whole grain foods – brown rice and whole wheat wraps, for example – are high in fiber and other nutrients. Mediterranean Tuna Wrap – Stuff a whole wheat tortilla with tuna, organic romaine, olives, peppers, pickles, and a Mediterranean inspired salad. Turkey Hummus Sandwich – Turkey, cheese, lettuce, tomato, and hummus on whole wheat bread. Quinoa Salad – Toss quinoa, nuts, raisins, dried cranberries, cilantro, lemon juice, and olive oil. Step-by-step instructions on how to make the best hummus.